You may be a bit confused looking at the title of this post. I can imagine you’re thinking, “I do not want my children playing while we are engaged in family meal time.” At a young age, it is vital for our young ones to have time to play with their food, and we will get into that later, but that’s not exactly what I am referring to in this blog post title. 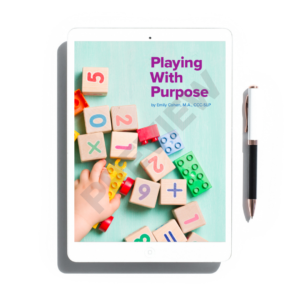 Remember, the ideas behind Playing With Purpose is that you bring some intentionality into the time you spend with your children. When you do you can develop and build their speech and language skills. 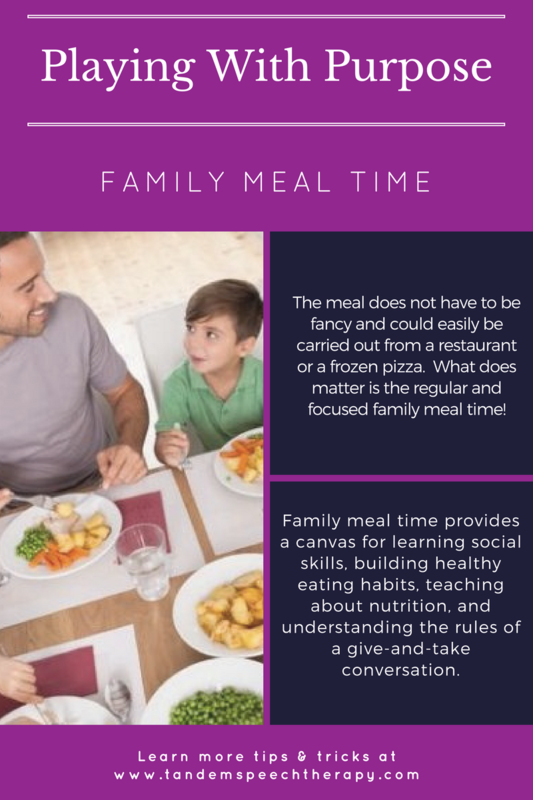 Family meal time is a great opportunity for building these skills as it’s a familiar, daily routine. Routines mean repetition. Repetition is critical for growing and learning new skills. You are a busy parent or caregiver. Work, your child’s activities, social engagements, civic involvement, and family responsibilities tug at your time every day. Despite this busy-ness, I encourage you to take time each day to eat as a family. You will reap quality time and lasting benefits. If dinner is a super busy time of day, then sit down for breakfasts in the morning or lunches on the weekend. The meal does not have to be fancy. It could easily be carried out from a restaurant or a frozen pizza. What does matter is the regular and focused family meal time! Get your children involved during family meal time with other routines you commonly engage in such as grocery shopping and cooking. Cooking together will expose kids to new vocabulary, provide an opportunity to address following directions skills, create moments of connection and bonding, allow you to get your hands dirty, and ideally be fun. There are many cookbooks on the market designed for use with your children. However, another activity I recommend is creating your own family cookbook that contains recipes each family member loves. Messy play is incredibly beneficial for babies. It offers many opportunities for learning in a variety of developing areas and is excellent during family meal time. Talk to your baby while he plays with the food; talk about how it feels, what color it is, what it tastes like, and use many descriptive words. This early exposure to new and different vocabulary will show up later as your baby begins to speak and expand his sentences. Family meal time is another opportunity to teach your child social skills. They can learn these skills from your example and the ways you model appropriate social interaction. From a young age, we can show children how to use words like “please” and “thank you.” They will learn turn-taking skills as they wait for a dish to be passed or served. You can model behaviors such as keeping elbows off the table and focusing your attention on the speaker with eye contact and body language. You can have your child work on requesting objects by having him ask for all of the different foods served at dinner. 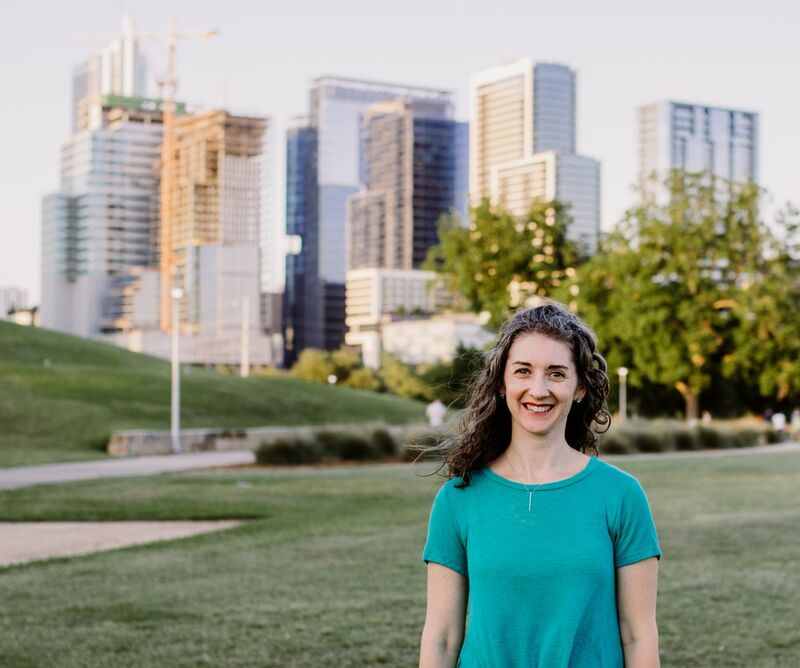 It is an opportunity to use one of my favorite Hanen strategies called “offer a little bit, then wait.” Start by giving your child a small portion of each food. Then, when he wants more of something, have him ask you for more. The amount of language you expect your child to use is dependant on his current skills. Try to make your child use slightly more language than he is spontaneously using. For example, if your child uses one word to request “milk,” help him use a two-word phrase to request such as “want milk.” If your child has more language, you can have him ask using a full sentence with correct grammar. While sitting at the table, you can teach the conversation skills of asking and answering questions appropriately. Try using these conversation starters or an open-ended question to help elicit a more extended response. An open-ended question allows a child to use more than a yes/no answer to communicate. For example, “What do you want to eat for lunch tomorrow?” gives your child a chance to think of their own ideas, practice vocabulary, share specific thoughts, and be creative. During a therapy session earlier this week, I recommended that a family make dinner time into “good speech sound” time. I made this suggestion because we are working to help their child use her speech sounds more proficiently in conversational speech. Start by setting a time limit. Then let your child know you are going to help her remember to use her good sound. Having an activity to do like family meal time, will help pass the time and likely be less overwhelming. Every time you hear your child miss her sound, gently remind her of it. The beautiful thing about working on speech sounds this way is that your child knows you’re not going to bug her all the time since most meals are a fairly standard length. Take advantage of this upcoming holiday season with more opportunities for family meal time and be sure you are Playing With Purpose at your table!